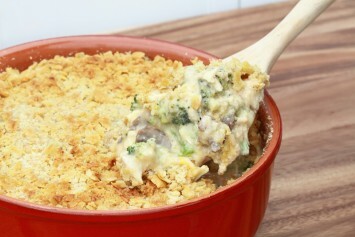 This easy to make chicken and broccoli cheese casserole recipe comes from my good friend Linda. It is absolutely delicious and has saved me many times when I’ve needed a quick and easy dinner recipe. Although the recipe calls for frozen broccoli, I usually use fresh. Cut chicken into large chunks and cook (microwave or boil just until cooked through). Arrange frozen broccoli evenly in bottom of 13"x9" casserole dish. (If you are using fresh broccoli, steam or boil lightly, until just underdone). Arrange cooked chicken over broccoli. Mix together - undiluted soup, mayonnaise, lemon juice, curry powder. Pour over chicken. Sprinkle with grated cheese. Top with bread crumbs tossed in melted butter. Bake uncovered at 350° for 30 minutes or until cheese is melted and sauce mixture is bubbling around the edges. Cooking the chicken breasts while you are getting the other ingredients ready makes preparation of this dish quick and easy. The recipe just calls for cream soup. Cream of chicken certainly works, but so does cream of mushroom, celery or broccoli. You can easily multiply quantities to serve a larger crowd. You can assemble the casserole 24 hours in advance and keep covered in the fridge. Just increase baking time to 40 or 50 minutes. To make this a low fat entrée, substitute low fat mayo or low fat plain yogurt for the regular mayonnaise. You can also replace the cream soup with a low fat version. Using either fresh or frozen broccoli, this recipe is so good, I think even broccoli haters will love this one. It’s a great easy mid week dinner recipe but a wonderful recipe for entertaining too. Everyone I have ever served it too loves it and asks for the recipe. I don’t know where she got it, but it’s a winner. Now that you’ve tried this Broccoli Cheese Casserole Recipe, check out some other great broccoli recipes. Serve this broccoli casserole with a great salad and dinner is done.